The Pianist is a powerful, devastating movie about a young man who survives the Nazi occupation of Warsaw. I only wish I had known in advance what I was in for. It would have been good to know that The Pianist is a biography, and therefore doesn’t have a traditional story arc. It would have also been good to know that director Roman Polanski himself survived the Nazi occupation of Krakow. His father arranged his escape just before being taken to a concentration camp. Roman survived by hiding in movie theaters, with Christians, and outside of town. So although the film is about the pianist Wladislaw Szpilman, it is told by a director who lived through the same experience. The Pianist opens on a bright Poland with a few shadows of an oncoming storm. The Szpilmans still have their house, their belongings, and their money, but slowly their freedoms are taken away. First they lose the right to be in public parks. Next they must make and wear arm bands with the Star of David. Then they must give up any money over 2,000 zlotys. Finally, they must move from their home into the new Jewish ghetto. In the second act, the Szpilmans are sent away to a concentration camp. 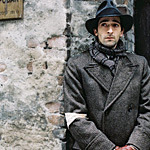 Only Wladislaw (Adrien Brody) escapes and is able to remain in town as a laborer. The storm clouds have arrived and are raining on the few remaining Polish Jews. Random executions are the norm, and the workers plan a rebellion. Before the rebellion takes place, Wladislaw escapes the ghetto, hoping to hide among the Christians in the city. Unable to do anything except hide, Wladislaw’s spirits and body become weak. The rain has become an hopeless winter of sickness and ash. Although this film could have been made about a bricklayer or a bookkeeper, it is about a pianist. Throughout the film, Wladislaw is able to find some solace in playing the piano. In the opening scene, a bomb rocks the radio station where he works, but he keeps playing. During the occupation he plays for the Jewish profiteers who get rich off the suffering in the ghetto. In hiding, he plays the piano inside his head, moving his fingers over invisible keys. The most moving scene in the film comes during the winter of 1945. Wladislaw hasn’t spoken a word in months. His clothes hang off him like oversized rags (Brody lost 30 pounds to play the role). He is barely recognizable as a human being. Late one night after searching for something to eat, he meets a well-fed Nazi officer, who commands him to play something on an abandoned piano. Wladislaw addresses the piano, taking a moment to get in the right frame of mind, and suddenly there is music. There is no question as to his humanity, so long as he can make this music. Even as the song ends, we see the sadness creep back into Szpilman. He plays three or four codas, hoping the piece will never end. But eventually he plays the last chord and reverts back to his mute, starved, half-human self. But this movie isn’t “going” somewhere. It is not leading to a conclusion. Rather, it is a deposition. It is the combined declaration of two witnesses — Szpilman, who wrote the memoir, and director Polanski. This is what they saw in Poland. These things happened. These were the details. It is these details that make The Pianist so memorable. They stand out like Spielberg’s red-coated little girl in Schindler’s List, only more subtle. Polanski shows us the gypsy who keeps asking about her husband, the old man in the wheelchair who is killed for not standing at attention, and the boy halfway through a hole in the wall who is beaten to death even though his head and torso are unharmed. Polanski shows us a girl shot dead in a street. She falls in an awkward position, and she remains there for days as Szpilman watches, safe, but helpless from his hideout. These tiny moments are devastating individually. When so many of them fill a single person’s story their effect changes from devastating to surreal. The horror is so inhuman, yet so commonplace, that we think we must be dreaming. Indeed, after Szpilman leaves his safehouse he seems to be wandering in a dream-state, through nightmarish streets of rubble and ruin. These powerful images make The Pianist an unforgettable movie, and, on second thought, possibly one of the best of 2002.